I am thrilled and excited to announce to you that I am one of the brand ambassadors for this YEAR for Egg Farmers of Canada. 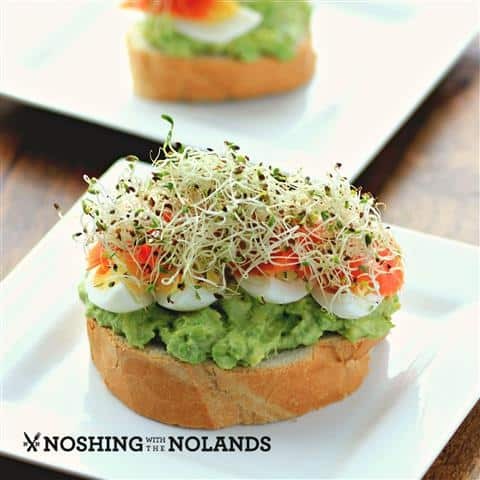 We at Noshing With The Nolands, love our eggs and are always creating new and exciting recipes to serve up these little gems. A simple egg salad puts huge smiles on my family’s faces. To bump that simple egg salad sandwich up a notch, I made to screaming rave reviews, an Open Faced Egg Avocado Smoked Salmon Sandwich. We are blessed in Canada to have more than 1,000 Canadian Egg Farmers operating across our nation. More and more young people are taking part in egg farming. Many of them taking over their family farms, some up to a 10th generation. 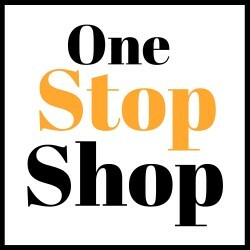 All of them producing a constant supply of fresh, local, high-quality eggs. Yes, we are very blessed to have these at the ready anytime we need them. Come on over to meet some of the Canadian Egg Farmers by visiting On The Farm. I found my inspiration from one of their recipes for an open faced sandwich. Who better to ask how to serve eggs than one who farms them! Check out all the recipes in Farmer’s Favorites. You can make this sandwich for a great power lunch. It is portable too, just bring the ingredients separately and build it when ready to eat! The protein from this sandwich will have you going strong all afternoon long! This can also be made for dinner with a gorgeous salad or soup on the side. A perfectly cooked hard boiled egg is hard to beat. You can learn how to make them on their site in Eggs 101. This recipe will take you right into spring with all it’s lovely colors and flavors!! 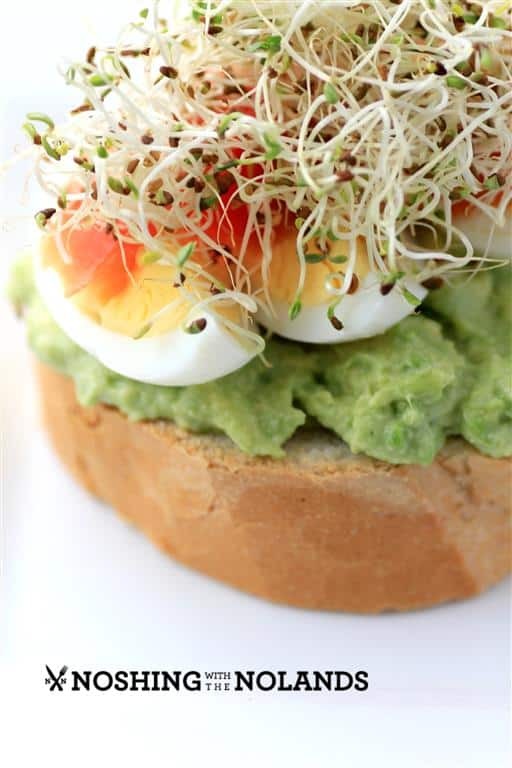 A delicious and fast sandwich using the goodness from eggs! Mash the avocado with a fork but leave it slightly chunky. Gently mix in the lemon juice, garlic salt, pepper and sour cream. Divide the avocado between the two slices of bread. Slice the eggs in quarters and place four slices of egg per bread slice. Top with the smoked salmon and alfalfa sprouts. Serve. Come and follow Egg Farmers of Canada on Facebook for great recipe ideas. Tweet to them on Twitter @eggsoeufs and pin on Pinterest! I invite you to share this yumminess at my Thursday hop ( you can link up through Sat midnight) . Hugs! I just love the sound of this one Tara! I love all the ingredients in these open faced sandwiches Tara! Smoked salmon is my favorite! This looks delicious! 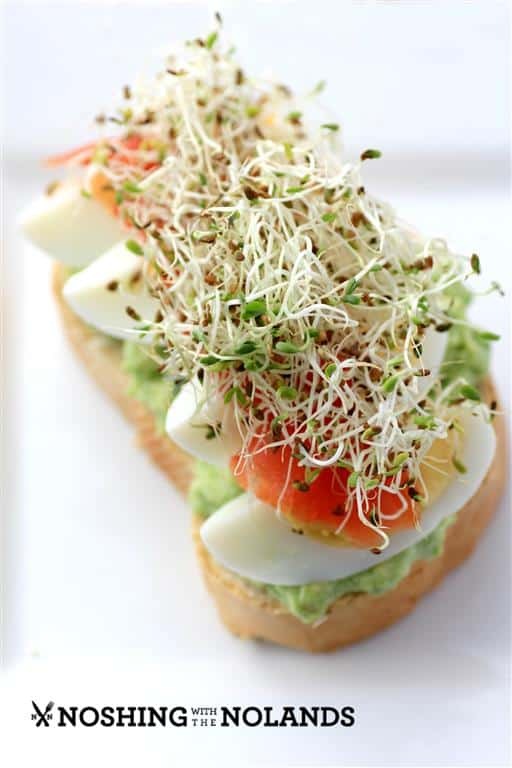 I love hard boiled eggs, and this sandwich looks like a real treat! Great combo of ingredients/flavors! 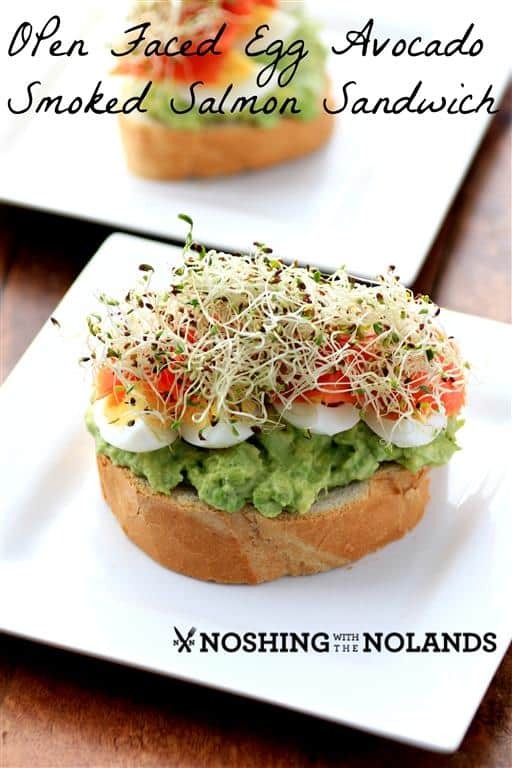 That is such a pretty open faced sandwich! Easy to make, lovely to look at and delicious to eat. Hi Tara – Thanks for sharing this with the Let’s Get Real party. I am pinning it to our group board on Pinterest.